Confusing at best, meaningless at worst, the digital transformation catchphrase has today become an agonizing reality for CIO’s and businesses alike. While change has been a constant for humanity, today it is the rapid pace of change that has brought this riveting focus onto transformation. In the face of the volatility and complexity of today’s environments, a transformation has become an imperative, more than ever before. Forward-thinking companies are launching preemptive digital transformations while reskilling and retooling their organizations. The harsh reality, however, is that nearly 75% of all transformations fail. (Boston Consulting Group). This brings us to the question, do we really know what transformation is? How has it evolved from its legacy connotations? And how have we, as people and organizations, evolved with it? To understand this better, let’s examine the evolution of the word. If we take a look at our past efforts to make ourselves happier, more successful and healthier, the dawn of the modern self-help era in the ’50s was a crucial turning point. Everyone was talking about setting personal goals for transforming their lives. Strategies to rid our minds of self-doubt, build confidence, win friends and success topped the agenda. As we tumbled onto the 70’s, our transformation goals evolved, but still remained personal. We were now seeking self-actualization and working actively to become better versions of ourselves. Fast-forward to today and the digital age has completely disrupted our perception of transformation. Where earlier transformation goals were personal, today they have become global. Where earlier our self-actualization sufficed, today we strive to be constantly engaged, continuously learning, digital natives who are global citizens. Where earlier transformation meant a host of things, from personal development to transmutation of ideologies, today somehow the concept is largely viewed in its ‘digital’ connotations. The dictionary definition of transformation terms it a marked change in form, nature, or appearance. However our new-age definition in today’s real-time instant gratification era views transformation in conjunction with speed. Where earlier transformation was seen as a slow and gradual process of change and progress, today transformation is all about agility. Probably this is why today we are deeply invested in our digital journeys, as opposed to our personal ones a decade ago. This transition in focus from personal to digital is not necessarily a bad thing. The competitive advantages that once gave companies a secure position – from their Fast-forward to today and the digital age has completely disrupted our perception of transformation. products and scale to their legacy expertise – are no longer enough in the digital era. A start-up with a new or more agile operating model could soon supplant an established organization and the same is true for people. Retraining and reskilling, largely in the digital domain, is a top talent prerequisite to allowing talent to remain relevant in the digital age. However, what organizations need to be wary of is jumping on the transformation bandwagon for the “sake of it”. For transformation to be meaningful, it will always need to be tied to personal goals and what you really want to achieve, the same holds true for organizations. Investing in digital transformation does not mean adopting a million dollar technology framework or fancy apps. That is like wearing a golden mask for a pretty exterior. Remember the story of a ragged Cinderella magically transforming into a glittering Princess at the touch of a wand? Unfortunately for many businesses, this is the definition of transformation – a quick fix that presents a pretty exterior. But transformation is not your magic wand that can photoshop your ordinary reality into a virtual diva. Transformation does not come packaged in a box. Transformation runs deeper. Transformation is not about updating your technology. It is about upgrading your strategic thinking. Transformation is a process and an enabler of progress. The drivers for transformation need to be internal, and tied to personal goals and objectives for growth and development of organizational abilities, for it to make a real impact. Research indicates that the human experience is vital to raising an organization’s Digital IQ (HBR). 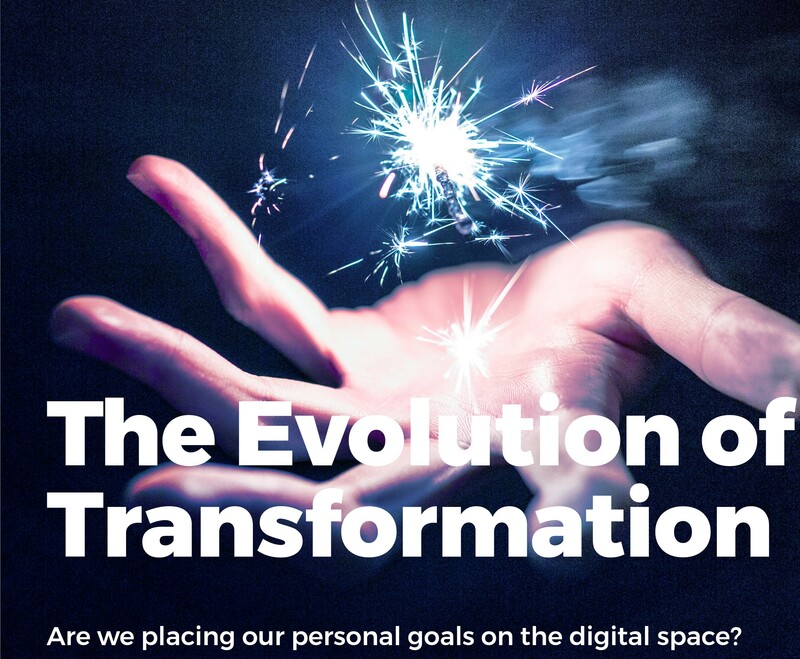 So maybe its time to think whether putting our personal goals onto our digital space and mixing them up a bit, might be the right recipe for successful transformation?